As long as there are credits to be earned, bounty hunters will always have a place in the galaxy. While the Outer Rim is flush with notorious hunters trying to earn a little profit, an elite few have risen above the rabble and established a reputation of perfection. (Convergence, 39). 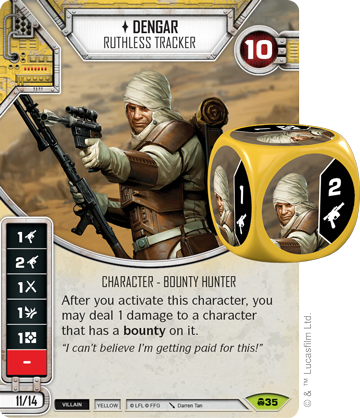 And embracing bounties is a theme you’ll find throughout this bounty hunter’s cards, not only with Dengar himself, but with the equipment he uses to hunt down his quarries. 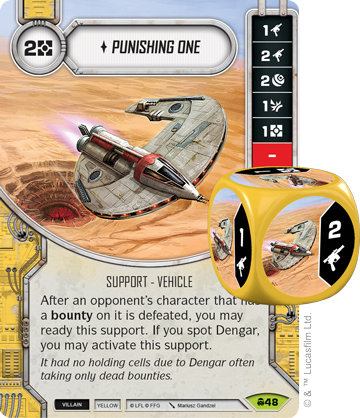 (Convergence, 48) is Dengar’s signature ship, and you can ready this ship when a character with a bounty is brought in. Dengar knows his ship better than anyone, and he can immediately activate Punishing One when this happens, ready to track down more prey. 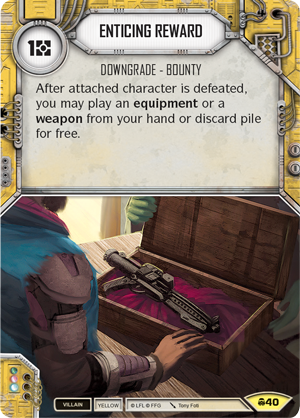 With three damage-dealing sides, harnessing the power of the Punishing One is a sure way to bring in your bounties. Of course sometimes the hunt requires a more personal touch. (Convergence, 50) is a weapon that automatically deals one damage to any character with a bounty when it enters the field. While it is a damaging weapon in its own right, it also synergizes well with Dengar, letting you turn the bounty hunter’s die to any side showing a one, including his melee damage which can be modified with the Fire Blade’s massive melee damage modifier. (Way of the Force, 142) as a reward for your bounty! (Empire at War, 4), negating their primary effectiveness. However, getting rid of Mind Extraction is also a tax, forcing you to exhaust the attached character and giving up on their dice for a turn. 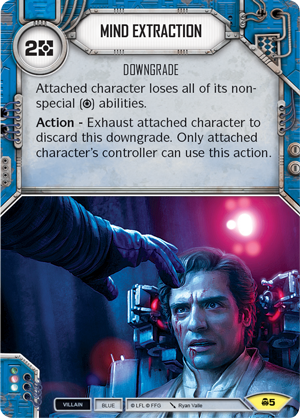 If you can spot an essential character that has been enhanced with upgrades, Mind Extraction can halt your opponent’s momentum as they are forced to deal with its effect in one way or another. (Convergence, 105) takes a more subtle approach. 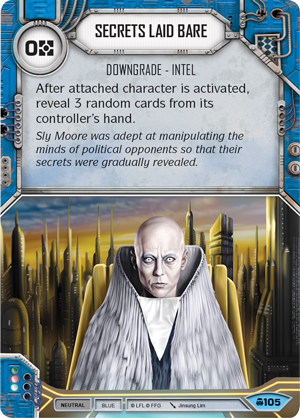 Any time the attached character is activated your opponent reveals three random cards from their hand. At no cost, Secrets Laid Bare is a low-risk play that can give you vital information during the battle. (Convergence, 1). 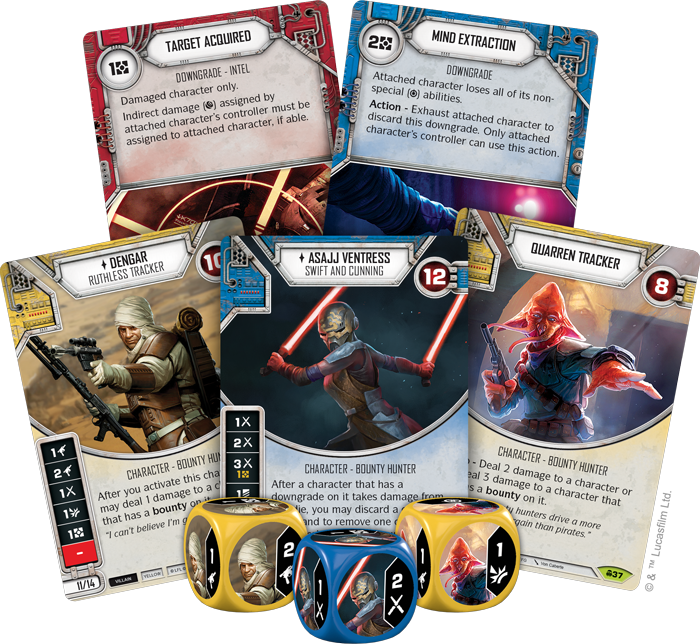 With three damage sides, Ventress can constantly attack your opponent, and if those opponents have a downgrade attached, Ventress can further disrupt your opponent’s plans by discarding a card to remove one of their character or upgrade dice. With the ability to both deal massive damage and remove dice, Asajj Ventress is one of the most dangerous characters in Convergence. 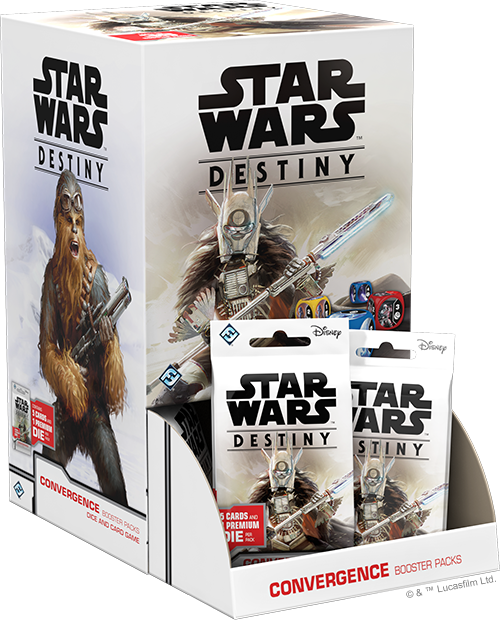 The duels of the Star Wars galaxy take their toll, victory doesn’t come without a cost and characters can become injured in search of their destiny. 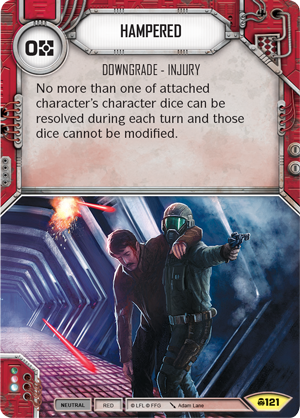 (Across the Galaxy, 1) can fall to the Hampered downgrade, severely limiting his utility as one of his terrifying dice becomes useless. These downgrades are powerful, and if played early can impact the entire game. Luckily, Convergence also features answers to this new card type. (Convergence, 167) is a one-cost event that simply allows you to discard a downgrade. 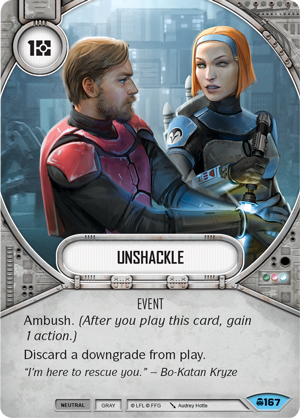 With the Ambush keyword, you can quickly unshackle your character and get them right back in the action, negating any penalty the downgrade inflicted or denying your opponent an enticing bounty.